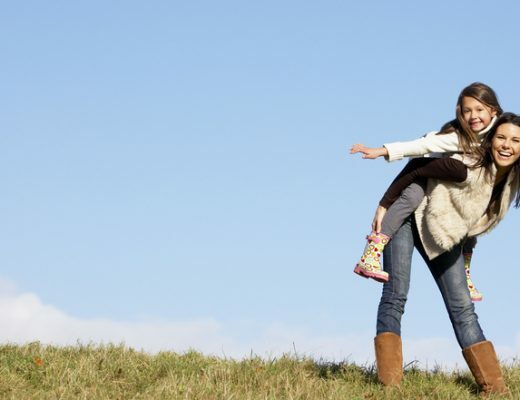 School’s back and sometimes the little ones left at home miss their older siblings. 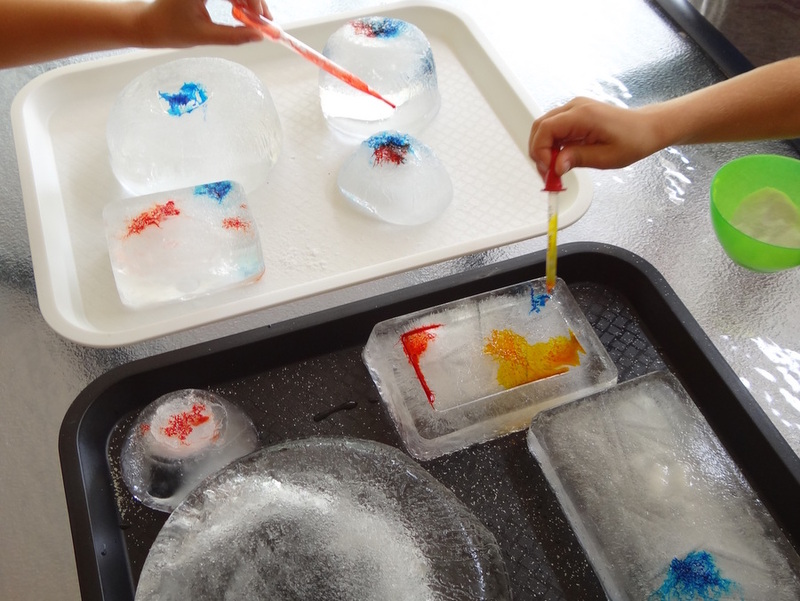 Here are a few quick and super fun experiments that you can do together to keep them occupied. 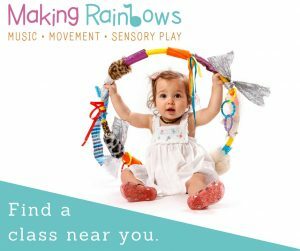 The best part is, they don’t need any special equipment or ingredients – these are all things that you should have at home already. You may need to buy some more food colouring when you are done though. We explain to our children that plants need water to live and grow but now you can show them the process right before their eyes. 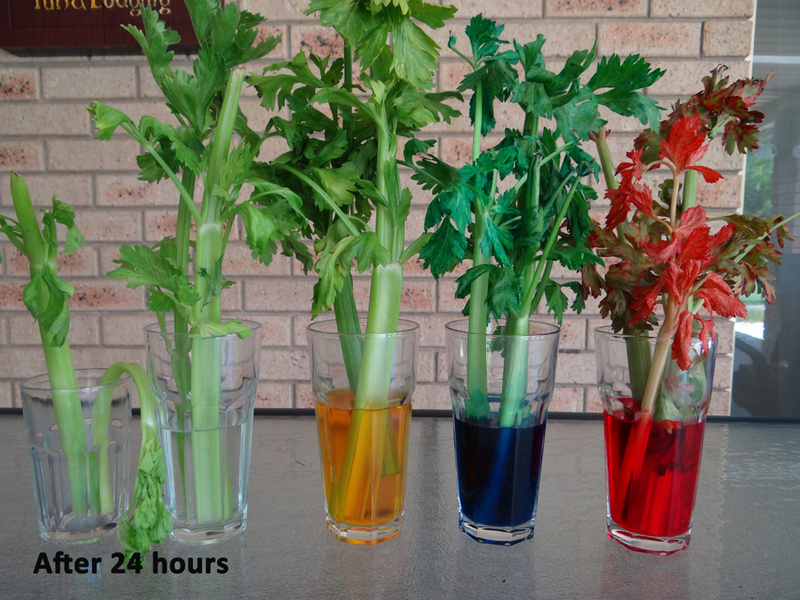 Place the celery in coloured water and over a number of hours, you can see the coloured water being absorbed into the celery. This process is called Osmosis. Chop the stems of the celery so they sit comfortably in the glasses. 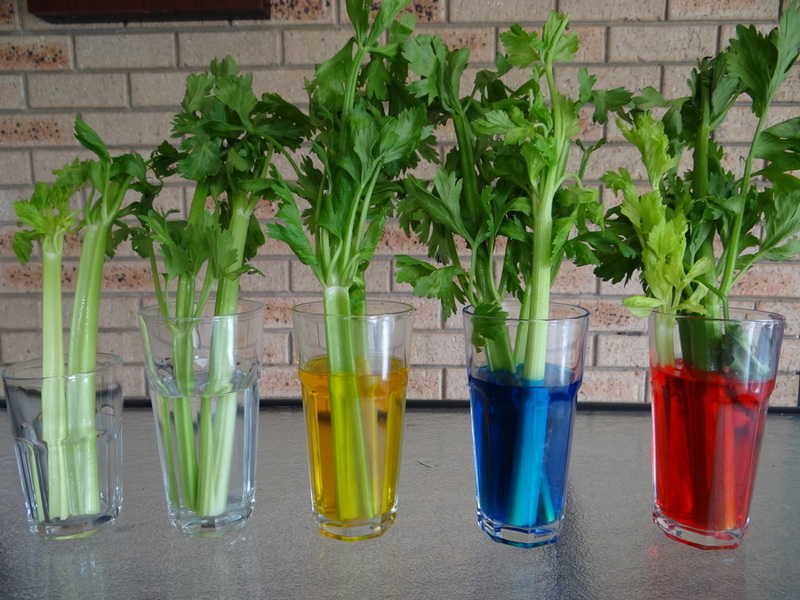 Fill each glass with water and add some food colouring. 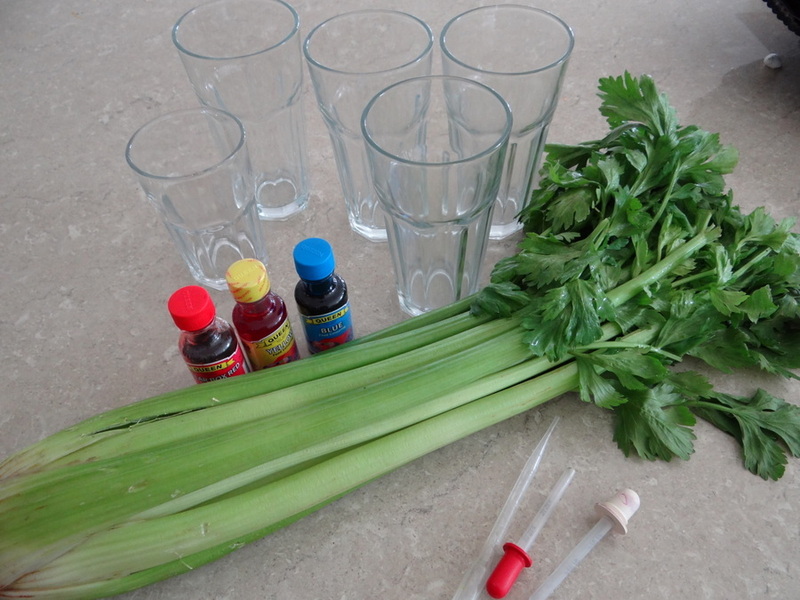 It is best to make the colour pretty strong so your children will easily see its absorption into the celery. I also left one glass with clear water and one glass with no water. 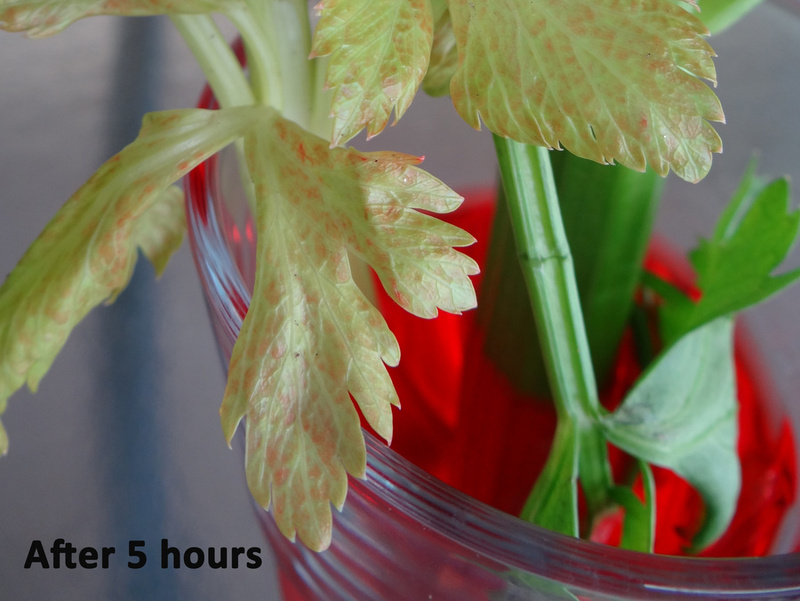 After about 5 hours, we can see the red colour slowly making its way into the leaves of the celery. Red is the first colour that we can see and the kids thought this was pretty cool. 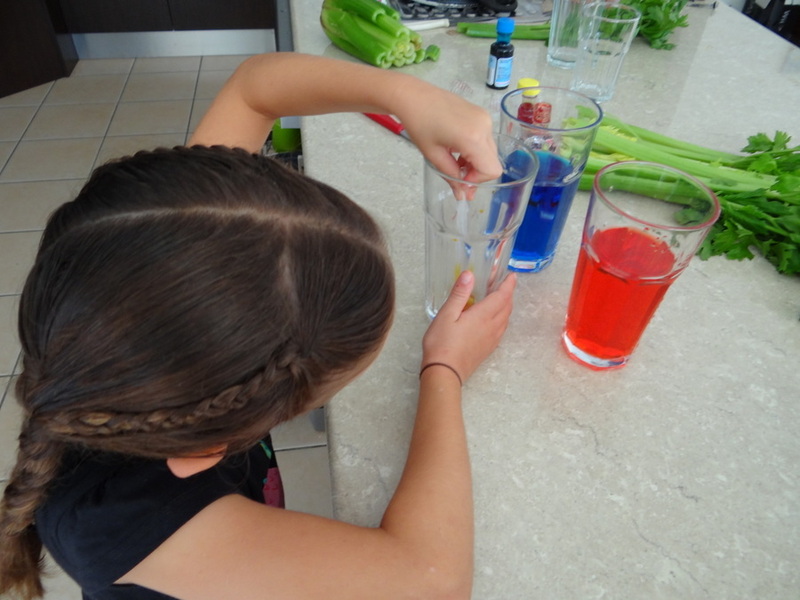 The celery has absorbed the water from the blue, red and yellow cups and the colour is quite prominent. The celery with the clear water remains green like celery normally is. The cup with no water in it at all shows the celery all limp and dying – since it had no water at all. Very cool! 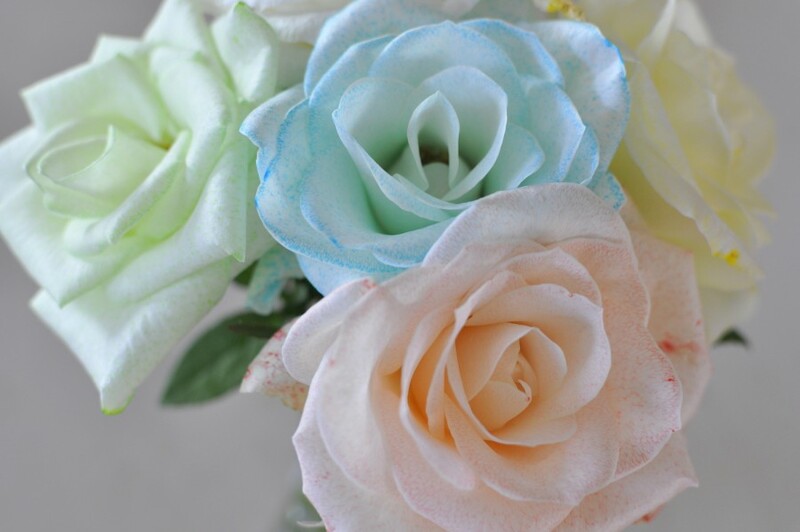 You can also do this with white roses or carnations, and you can see the experiment Kelly did with her kids here. Water freezes at 0 degrees Celcius. 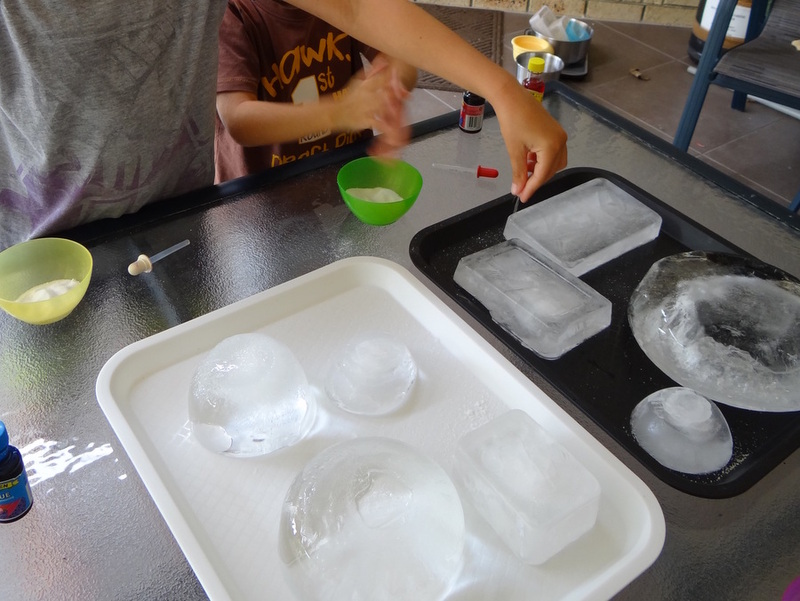 Salt lowers the freezing point and when sprinkled over ice, it causes some of the ice to melt. This then makes salt water which causes more ice to melt. 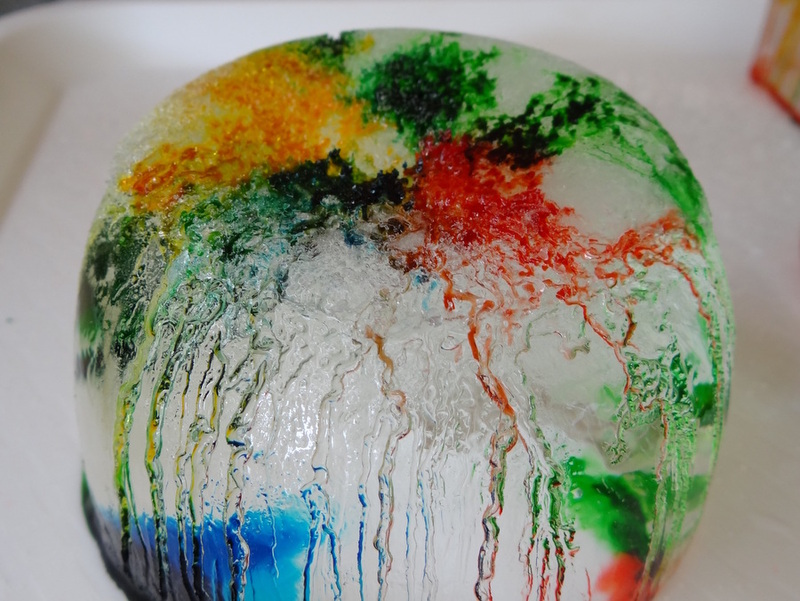 This experiment shows children that when ice is removed from the freezer and sprinkled with salt, cracks and crevices form in the ice which can be highlighted with food colouring. Large trays such as serving trays or oven trays with a lip on them. Make sure there is room in your freezer for a few containers of water. 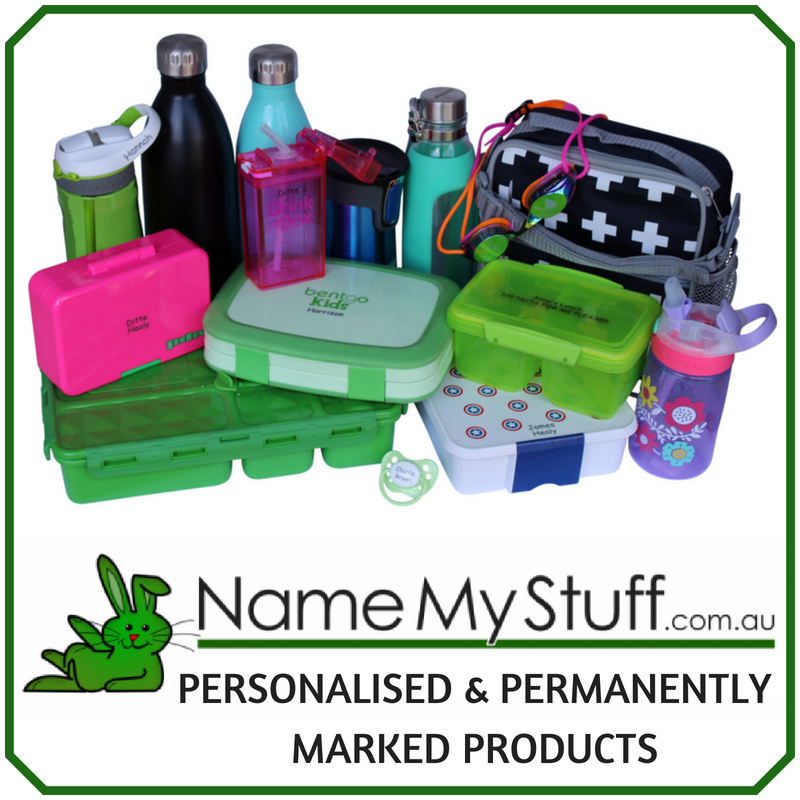 The containers can be large, small, round, square, deep, flat – whatever you have on hand will work. 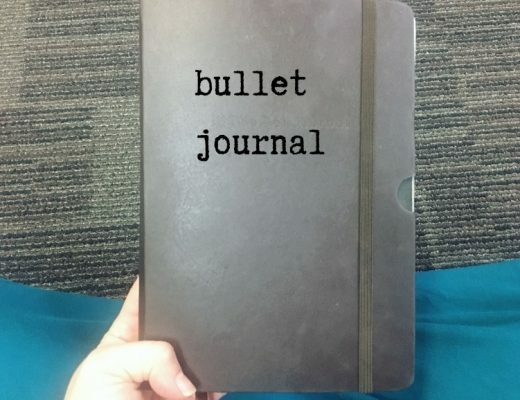 Fill them with water and place in the freezer. Keep overnight or until frozen solid. Remove from the freezer and place on the trays. Use trays with a lip to ensure that when the ice melt, coloured water doesn’t go all over the table and floor. Give your children some salt to sprinkle over the blocks of ice. 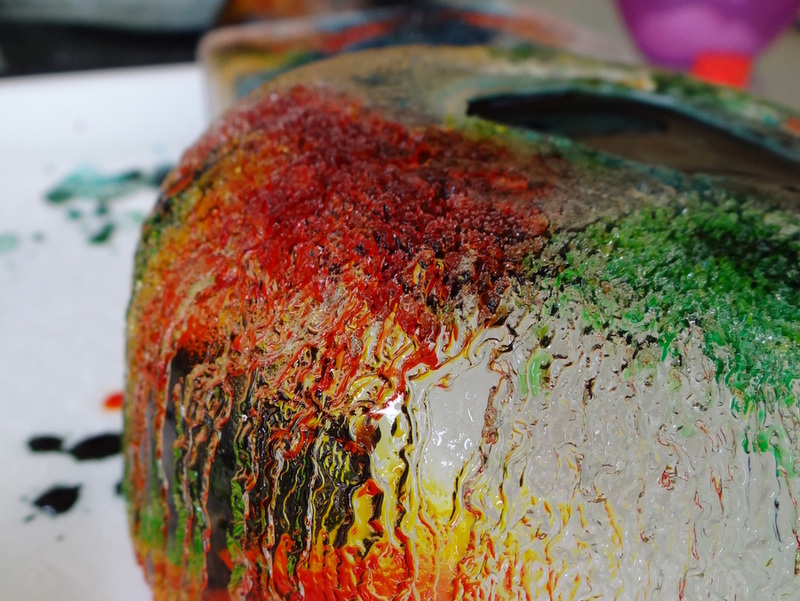 Sprinkle generously and cracks start to appear immediately. 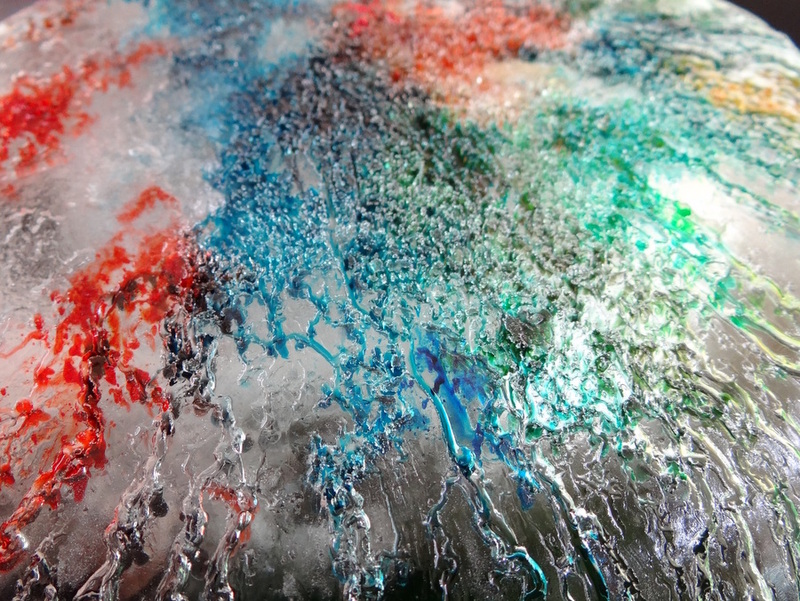 Using droppers, place drops of colour over the ice. It will run down into the cracks and show the beautiful patterns and images. 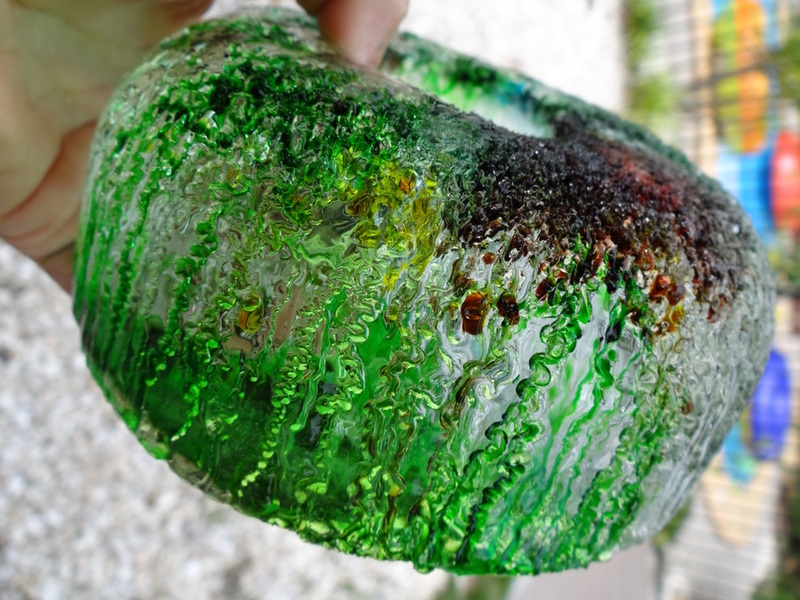 It was amazing and the kids played with it for such a long time. It was much more beautiful than I thought it would be!